NEW YORK, NY - Columbia University embraces the Pinball EduFun program at Modern Pinball's The Museum of Modern Pinball with an exclusive video produced by Columbia University's New Learning Times and disseminated to teachers and professors in their Teachers College. 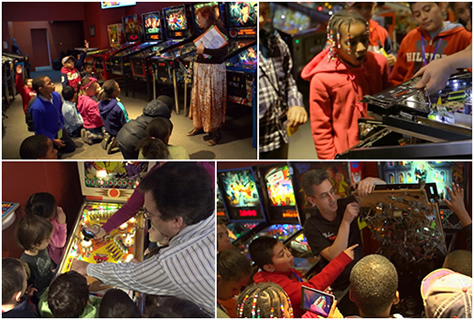 The Pinball EduFun program at The Museum of Modern Pinball was recently the feature of a standalone episode in Columbia University's "Seen In NY" - a series focusing on NYC-based education projects that are innovative and forward thinking. Seen In NY is produced by The New Learning Times, a Columbia University online publication that features current developments and future possibilities in education that make learning more accessible and powerful. It provides daily coverage of the transformation of learning opportunities in the information age for those shaping the future of education. Mr. Steven Zahler, who developed the unique education program at the center, invites teachers and their students for an informative and memorable field trip during which classes are given and real pinball machines are deconstructed and observed. "We expose the innards of actual pinball machines to examine the changing technology, electromagnets, circuits, electricity, and physical properties operating above and below the playfield. It's a way of uncovering the plethora of art and science in the games," he explains. And as predicted, once the students understand the properties at work, playing and learning become a lot more focused. . . and a lot more fun. The facility hosts class trips for all grade levels. In October, they hosted the prestigious New York University (NYU). "We're just getting started," Mr. Zahler said. "We're developing new programs and are really grateful to have Dr. Steve Marsh on board." Dr. Marsh is a scientist with a doctorate in science & engineering, was a U.S. Navy Research Scientist for over 10 years and taught grad and undergrad classes. He is currently a Registered Patent Attorney specializing in the technology space. Mr. Zahler added, "Dr. Marsh and I have taught several classes together and it's really amazing to witness the students' engagement, excitement and curiousity while demonstrating the machines, passing around pinball parts and discussing real-world applications and concepts." In the words of Coordinator and School Teacher Ms. Debra Rymer, "I took 15 enthusiastic 4th and 5th grade students for a lesson on Pinball Physics. Before the trip, we read about simple machines, magnets, and gravity. When we got there, the kids ooohed and ahhhed as the pinball machine's glass came off and they got to see inside as Steve explained electromagnets, circuits and electricity to them in brief terms. On the bus ride home, they wrote down the title and theme of their favorite machines and described them in specific terms, telling why they liked those particular machines. Our extension activity will be to design a pinball machine on paper. What a great, fun day. Thanks to all the folks at Modern Pinball for their flexibility and hospitality." The facility is open daily and caters to classes that need to arrive earlier than the posted operating hours. Title 1 rates are also available.